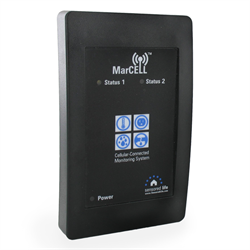 Monitor your home, cottage or seasonal property for power failures, low temperature (freeze alarm), and humidity without needing an Internet connection or phone line at the monitored location. The Sensored Life MarCEL uses cellular signals to communicate with their cloud service. In case power fails or power or humidity readings go out of range (high or low), you can receive an email, text message or even a voice call alert so you can take care of any potential problems right away before they cause damage. In case of a power failure, you will also receive a notification when power is restored. You can also check status using a web login.